I got some stitching stash from Down Sunshine Lane yesterday. I was able to get some things with the money I made from selling my old stash (thank you everyone!). :) The first thing I got was some fabric and the buttons for Shepherd's Bush's "Scatter Freedom." 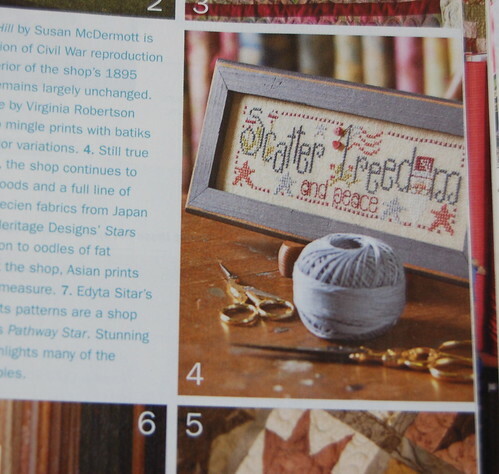 And I saw "Scatter Freedom" as one of their stitched models in their shop. I hadn't really looked at it before and thought it was so cute! So I decided to stitch it for the Fourth of July. I think I should be able to get it finished by the 4th. I also worked on "The Riddle" a little bit yesterday. I'm almost done with the bottom portion. 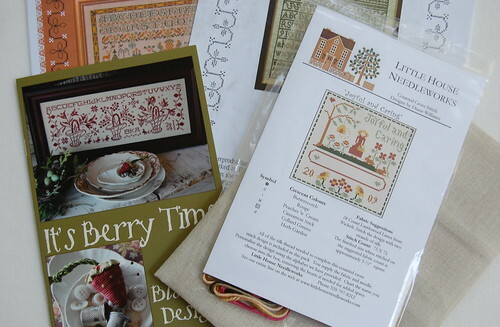 Moira Blackburn "Pains of Love" and "Emily Bronte Sampler," Blackbird Designs "It's Berry Time," LHN/CC thread pack "Joyful and Caring" and a fat 1/4 of 40 ct. Flax New Castle Linen. I had a couple people ask about my stitching... 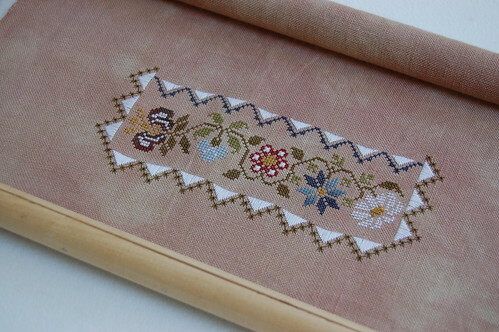 I normally stitch in hand, but I do use scroll frames for projects that are long or that have specialty stitches. I usually iron my pieces before taking a picture. I'm just picky that way - I can't help it! About the scroll frames I use - the one pictured is an old frame called Rolaframe that I got at my LNS when I lived in Georgia. I honestly don't know if they are still being made. I also use the EZ Stitch frame, which I know is still being made. You can find them at Michael's and other shops. 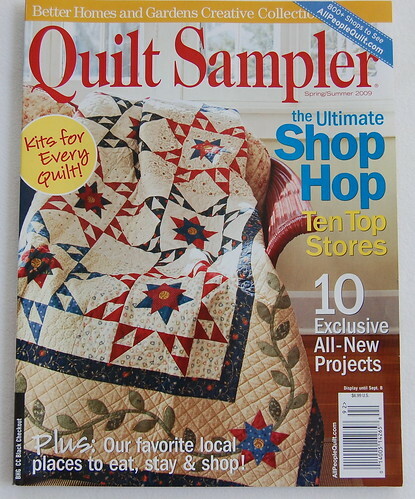 I also use Q-Snaps once in awhile, but not very often. I prefer to stitch in hand if at all possible. I don't use a stand with my frames, I tried them once, but I never got used to them. I love all of your new stash!! I have been thinking about doing something Shepherd's Bush too. I ran across some in a blog that are finished and this one you are doing is so cute for July 4th. The Riddle is looking so pretty too!! Love the progress. 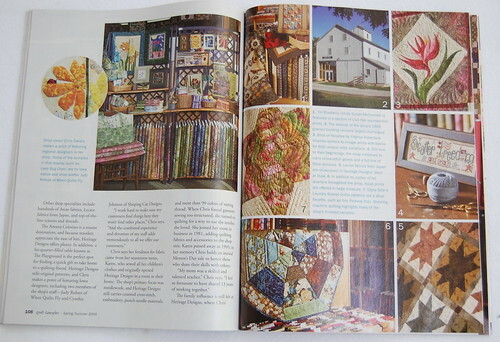 That is neat that you saw a cross stitch in a quilt magazine. Glad Amy had that one for you! I'm exactly the same way about my stitching. 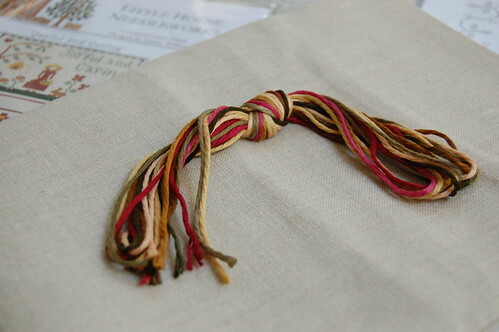 I stitch in hand whenever possible, but if it's too bit, or specialty stitching...in a frame or snaps it goes! I also have this magazine and noticed the chart. 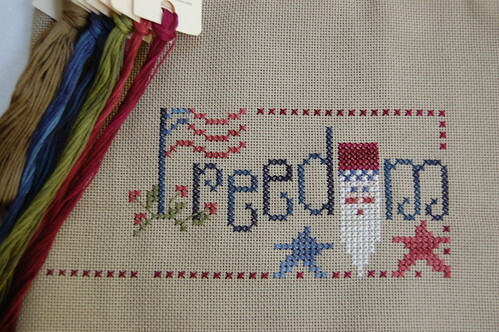 I stitched it last Fourth of July on 32 ct...very cute when it's all done! Lovely new stash! I really like how The Riddle is coming along. I have never even looked at Drawn Thread and now I'm *afraid* that you have enticed me to start something new! Great new stash ! Riddle is looking good and you sure got a lot done on Freedom, no doubt you will have it done by the 4th. Love your new stash -- and I love both your WIPs! Scatter Freedom is so cute! I love your new stash and your two projects. The Riddle especially - I love both the fabric and the colors of the threads. The new stash is awesome (as usual!). Can't think of any new stash I wouldn't like come to think of it. Your wips are great-the Riddle is a neat piece! Both WIPS are looking just gorgeous! Lovely new stash too.